Consulting Structural Engineer: John A. Martin Associates, Inc. Museums, armatures for collective societal experience and cultural expression, present new ways of interpreting the world. They contain knowledge, preserve information and transmit ideas; they stimulate curiosity, raise awareness and create opportunities for exchange. As instruments of education and social change, museums have the potential to shape our understanding of ourselves and the world in which we live. As our global environment faces ever more critical challenges, a broader understanding of the interdependence of natural systems is becoming more essential to our survival and evolution. Museums dedicated to nature and science play a key role in expanding our understanding of these complex systems. 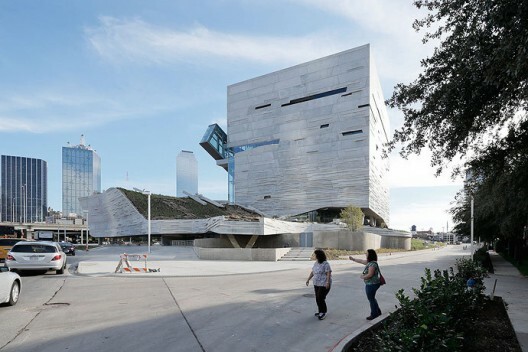 The new Perot Museum of Nature and Science in Victory Park will create a distinct identity for the Museum, enhance the institution's prominence in Dallas and enrich the city's evolving cultural fabric. Designed to engage a broad audience, invigorate young minds, and inspire wonder and curiosity in the daily lives of its visitors, the Museum will cultivate a memorable experience that will persist in the minds of its visitors and that will ultimately broaden individuals' and society's understanding of nature and science. 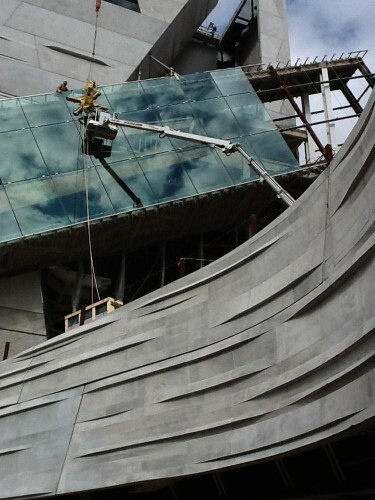 The Museum will strive to achieve the highest standards of sustainability possible for a building of its type. High performance design and incorporation of state of the art technologies will yield a new building that will minimize its impact on the environment. This world class facility will inspire awareness of science through an immersive and interactive environment that actively engages visitors. Rejecting the notion of museum architecture as neutral background for exhibits, the new building itself becomes an active tool for science education. 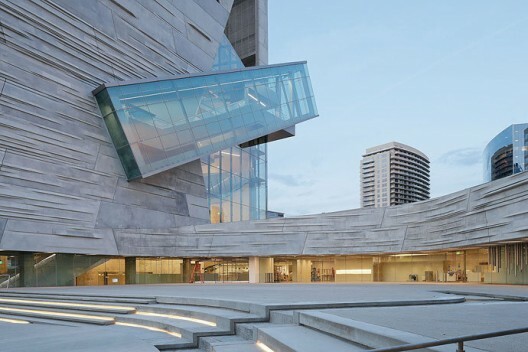 By integrating architecture, nature, and technology, the building demonstrates scientific principles and stimulates curiosity in our natural surroundings. 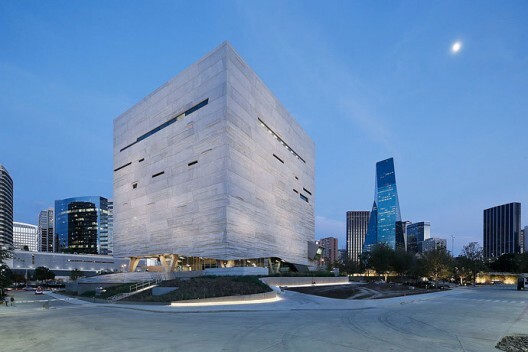 The immersive experience of nature within the city begins with the visitor's approach to the museum, which leads through two native Texas ecologies: a forest of large native canopy trees and a terrace of native desert xeriscaping. The xeriscaped terrace gently slopes up to connect with the museum's iconic stone roof. 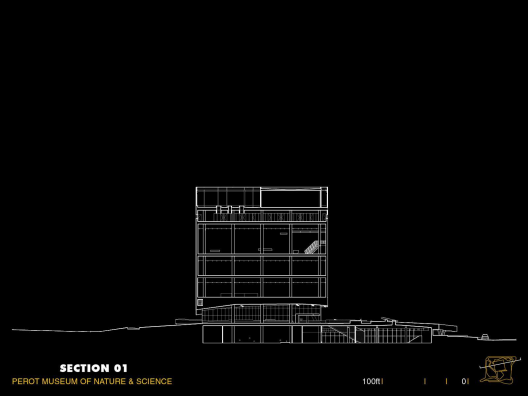 The overall building mass is conceived as a large cube floating over the site's landscaped plinth. An acre of undulating roofscape comprised of rock and native drought-resistant grasses reflects Dallas's indigenous geology and demonstrates a living system that will evolve naturally over time. 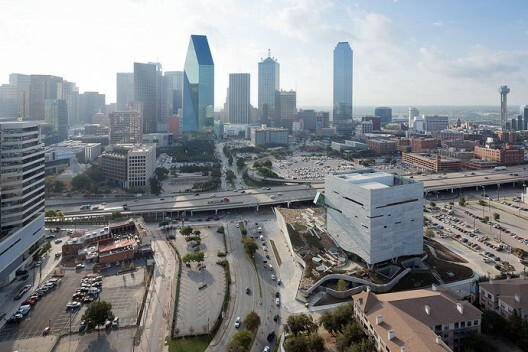 The intersection of these two ecologies defines the main entry plaza, a gathering and event area for visitors and an outdoor public space for the city of Dallas. From the plaza, the landscaped roof lifts up to draw visitors through a compressed space into the more expansive entry lobby. The topography of the lobby's undulating ceiling reflects the dynamism of the exterior landscape surface, blurring the distinction between inside and outside, and connecting the natural with the manmade. 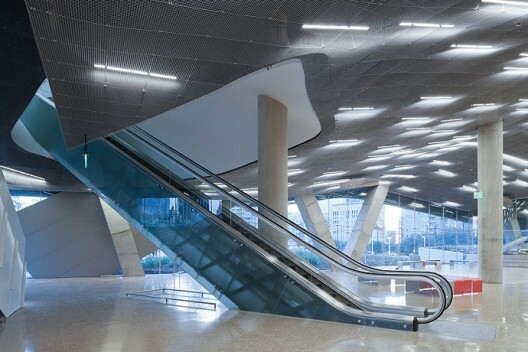 Moving from the compressed space of the entry, a visitor's gaze is drawn upward through the soaring open volume of the sky-lit atrium, the building's primary light-filled circulation space, which houses the building's stairs, escalators and elevators. From the ground floor, a series of escalators bring patrons though the atrium to the uppermost level of the museum. Patrons arrive at a fully glazed balcony high above the city, with a bird's eye view of downtown Dallas. From this sky balcony, visitors proceed downward in a clockwise spiral path through the galleries. This dynamic spatial procession creates a visceral experience that engages visitors and establishes an immediate connection to the immersive architectural and natural environment of the museum. 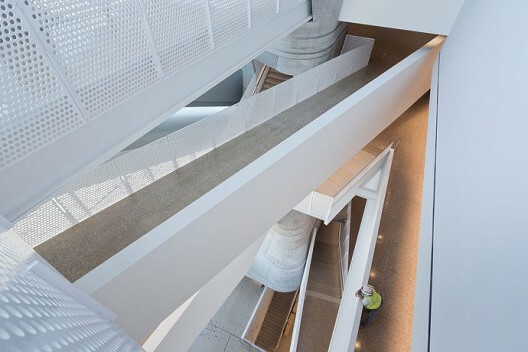 The path descending from the top floor through the museum's galleries weaves in and out of the building's main circulation atrium, alternately connecting the visitor with the internal world of the museum and with the external life of the city beyond. 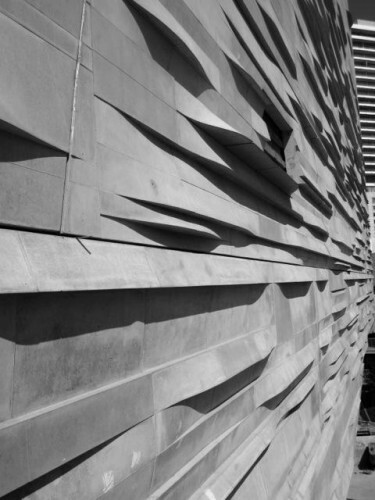 The visitor becomes part of the architecture, as the eastern facing corner of the building opens up towards downtown Dallas to reveal the activity within. 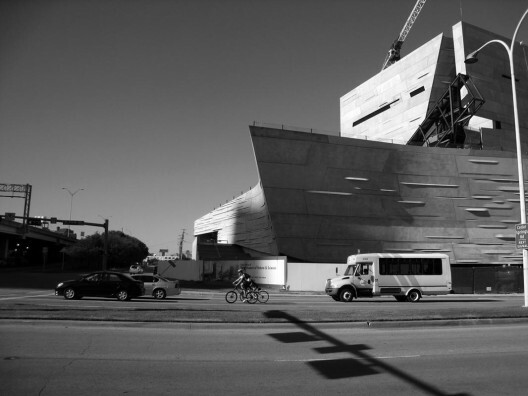 The museum, is thus, a fundamentally public building – a building that opens up, belongs to and activates the city; ultimately, the public is as integral to the museum as the museum is to the city.